1st class Reggae & Ska band with a line up of musicians that has played for many of the big names in the industry. Fully Insured & all electrical equipment is PAT Tested. (certificate available on req) Reliability Accomodating Great value Pro gear & Pro band Backing band to major stars and celebrities on the ska & reggae circuit. Supporting great artists such as... Susan Cadogan, Neville Staple (The Specials), Horace Panter, The Pioneers, Winston Reedy, Dennis Al Capone, Dandy Livingstone, Dave Barker, Stranger & Patsy, Aswad, Jools Holland, The Pressure Tenants, Laurel Aitken, The Aces, Delroy Williams, Glenroy Oakley and many more! Fronted by vocalist's Paul Harris who comes from the world of gospel music & the silky smooth voice of Joyce Harris (Pressure Tenants), both singers and musicians deliver a show that keeps you on the dance floor! The best live reggae tribute band i have ever seen! What a fantastic bunch of people and a great night was had by all with over a £1000 raised for the charity!! 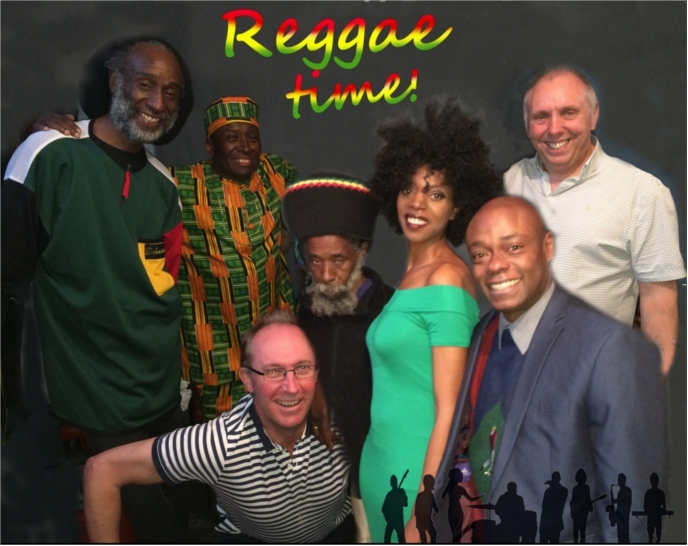 Great Live reggae band filled the Beer Tent to full capacity and wowed the audience with a stunning performance of reggae hits from the 70's and 80's... Amazing evening and we have booked them again to headline the event for 2012! OMG!! what a band! heavy reggae to classic Bob Marley!! love the band and re booking them for our Beetrootz festival! Tyler Maxwell Fund Raiser Many thanks to the band for all their support.. this was the 3rd gig in succession for this charity and they were absolutely brilliant. Steph. The Band Supported Neville Staple & His Band (The Specials) they were totally professional and absolutely superb to watch. Thoroughly entertaining and really got the audience going. In my opinion equally as good as the main act!! Definately a band on it's way to the top!! Craig. Thanks for a great night. We had a fab time. I think everyone enjoyed themselves and had a good time - especially birthday boy ! Many thanks and best wishes. Susan Cadogan, Neville Staple (The Specials), The Pioneers, Winston Reedy, Dennis Al Capone, Dandy Livingstone, Dave Barker, Stranger & Patsy, Aswad, Jools Holland, The Pressure Tenants, Laurel Aitken, Delroy Williams, Desmond Dekker's band The Aces and many more! Fronted by vocalist's Paul Harris who comes from the world of gospel music & the silky smooth voice of Natou Charles, both singers and musicians deliver a show that keeps you on the dance floor! Weddings & Parties.. too many to mention. Standard stage led lighting set up. 3x 4 way gang extentions.